Most risk managers think they are doing a great job. But how can you actually tell? To add to the challenge, despite the guidance provided in ISO 31000:2009, the concept of risk management effectiveness still remains a bit vague. Who can audit or validate your risk management effort to say whether it’s good or not? I mean there are internal and external auditors, but they often look at all the wrong things and ask useless questions about risk appetite, policies, frameworks, risk owners, mitigation plans and risk profiles. All of this has nothing to do with the true effective risk management. 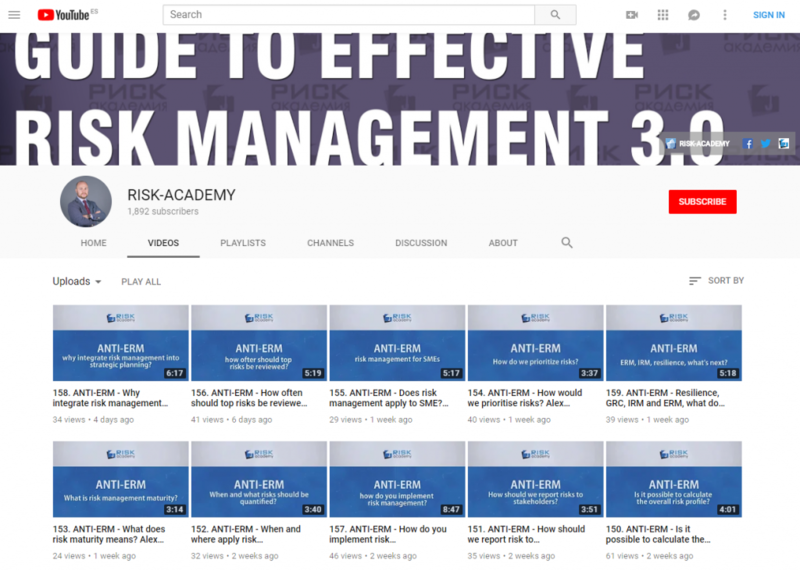 Join me for another RISK-ACADEMY free webinar to talk about four risk management effectiveness criteria, based on the ISO31000:2009 of course, because I am a fan 🙂 To learn how to audit/validate risk management effectiveness in non-financial companies in 4 simple steps register today. I will also talk about the upcoming G31000 risk management maturity model, an amazing tool to audit / validate risk management in any company. One of the most important tests of true risk management effectiveness is the level of risk management integration into decision making. My research shows that companies, capable of systematically integrating risk management into planning and budgeting decisions, investment decisions, core operational business processes and key supporting functions, achieve long-term sustainable advantage. Just consider an example of a large investment fund, which makes investment decisions only after an independent risks analysis and does simulations to test the effect of uncertainty on key project assumptions and forecasts. Another example is a large airline, which makes strategic decisions based on several alternatives with a risk assessment performed for each alternative. The final criterion for effective risk management has to do with the continuous improvement of the risk management framework and the risk team itself. One investment fund was able to do this with the help of regular assessment of the quality and timeliness of their risk analysis, annual risk management culture assessments as well as periodic review of risk management team competencies. For example, professional risk management certification helps to boost risk team competencies. One of the reasons behind the need for constant risk management improvement is rapid development of risk management discipline. The ISO 31000:2009 standard is currently being reviewed by more than 200 specialists from 30 different countries. Some of the suggestions for the new version of the standard include the greater need for integration of risk management into business activities, including decision making and the need to explicitly take into account human and cultural factors. These changes could have a significant impact on many modern non-financial organisations, raising questions about their risk management effectiveness. Next: Next post: What is Enterprise Risk Management (ERM)?